I’ve been asked to write about the differences between natural food colors and the synthetic ones that most cake decorators seem to use. Many brand name companies manufacture and distribute vibrant colors which can be identified as synthetic by the “E” numbers in their lists of ingredients. Unfortunately many colors containing these “E” numbers have been associated with hyperactivity and attention disorders in children and they pose risks of allergic reactions as well. A number of these synthetic food dyes, which also contain artificial preservatives, have even been banned by several countries in Europe. When I took my very first beginners’ course in the making of fondant flowers, we were introduced to the “Wilton” gel colors which were no doubt lovely, enticing and very easy to use. But when I asked the instructor about how unhealthy they might be, I was answered with, “We use just a very small amount. 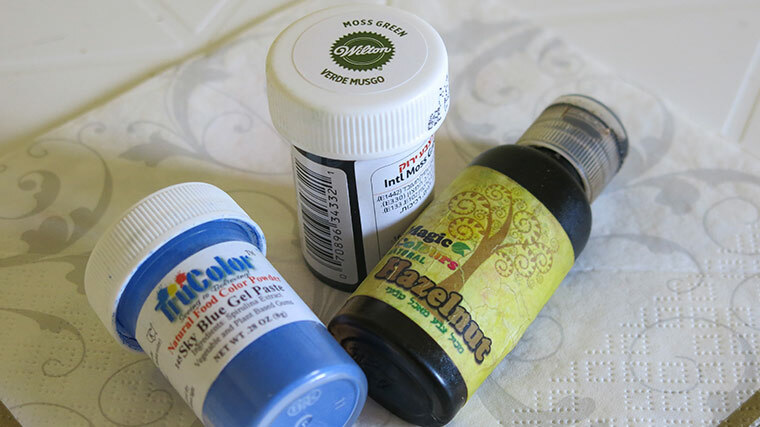 If you want color, then you have no choice.” It was then that I started checking the ingredient lists on the backs of those little containers. I did want color, but I didn’t want to be even slightly responsible for causing anyone ill health of any kind. 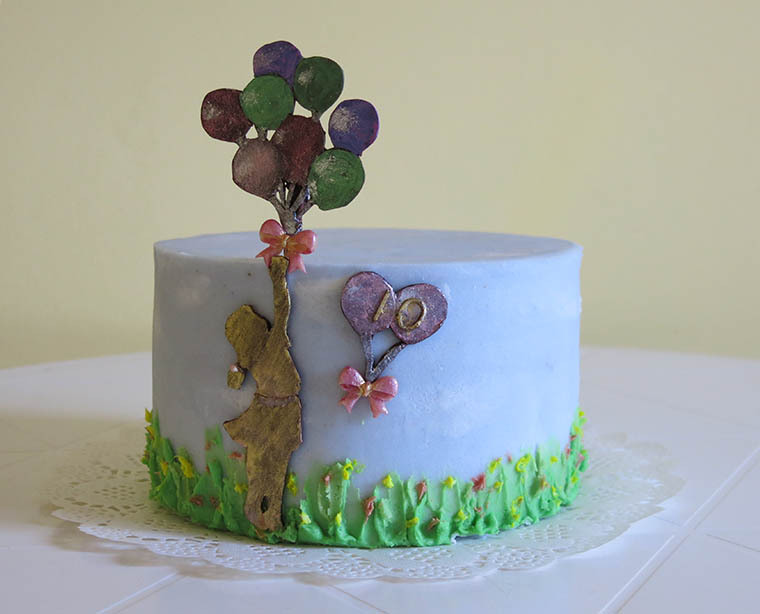 True, the decorations can often be peeled off the cake, or scraped off in the case of butter cream, but some people actually enjoy eating fondant and butter cream and a child would certainly not willingly forgo those extra bites of sweetness on a portion of festive birthday cake. It was then that I started looking into natural food colors. I did find “Magic Colors” natural gels. 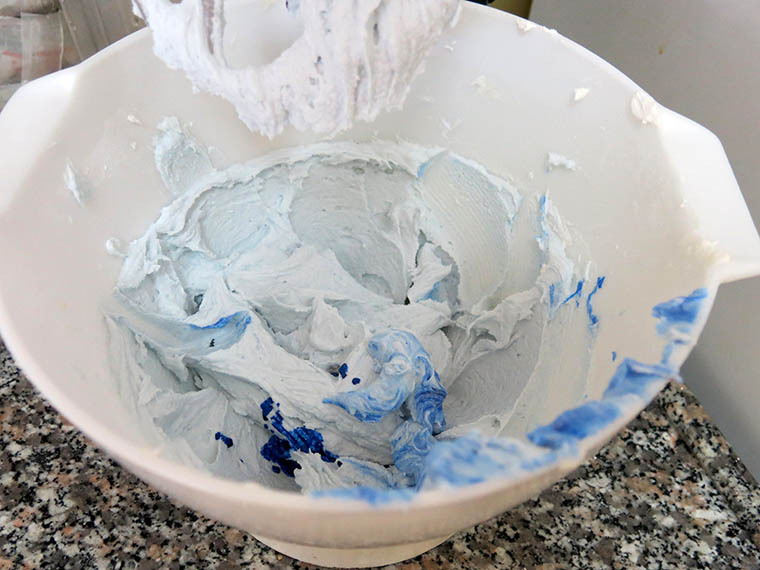 They were a bit more liquid than, for example, the “Wilton” gels and I did have to use much more of the color to get the shade that I desired, but they were natural and safe, and so, that’s what I used on anything that was expected to be eaten. The main disadvantage of the “Magic Colors” natural gels was that there were very few shades to choose from. The available ones were brown, yellow, apple green, pink and lavender. For a short while a pale blue was also available, but I was told that it was discontinued because of the instability of the product. Well, keeping healthy has its restrictions so I limited my cakes to the five natural colors available. The brown I actually quite liked and the yellow was brilliant, but the other three were extremely pale. I once used half a container of pink for a single batch of butter cream and it was still a very soft pink. But health is more important than beauty, so I made do and envied everyone else’s lovely creations. Then one day I came across a beautifully colored cake showing off strong blues, deep greens and even a true red. The decorator wrote as a “by the way” that she uses natural colors. I had never seen natural colors that were so rich and intense and immediately contacted her to get more information. If nothing else I wanted a natural blue. The sea, the sky, jeans … there are so many elements that are blue in color and all were out of my reach. That’s when I first heard of “TruColors” natural food color. Because the shipping of anything to Israel is dear, I had to wait patiently until a friend who was traveling could bring me the colors from the States. Not knowing whether I would really like the product or not, I ordered only three colors from the line that was made especially to tint butter cream. 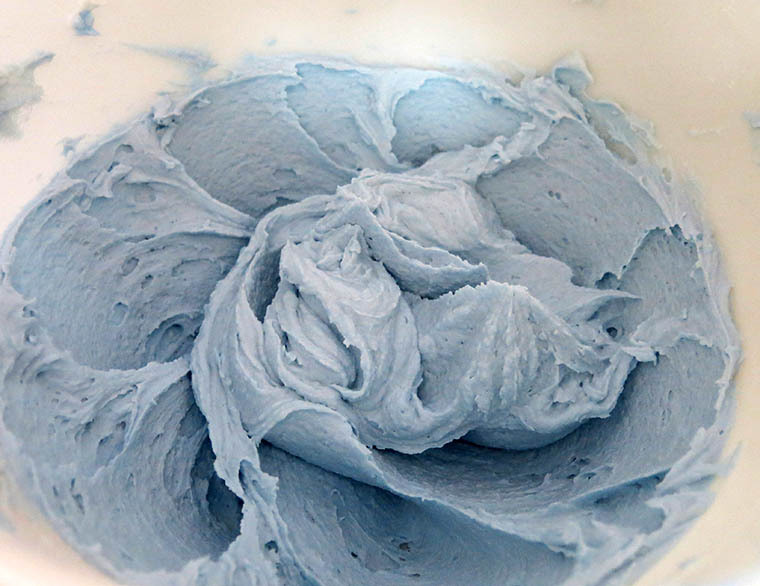 Now I have a wish list of more than a dozen must haves, some from the butter cream line and others that can be used as a paint on the dried surface of fondant, royal icing, and even on butter cream that has hardened. Since I’ve only tried the gel colors that are made for butter cream I’ll limit myself to talking about those. I purchased pink, sky blue 🙂 and green. I used the pink to color not only butter cream but also to mix into a 50-50 modeling chocolate – fondant combination. 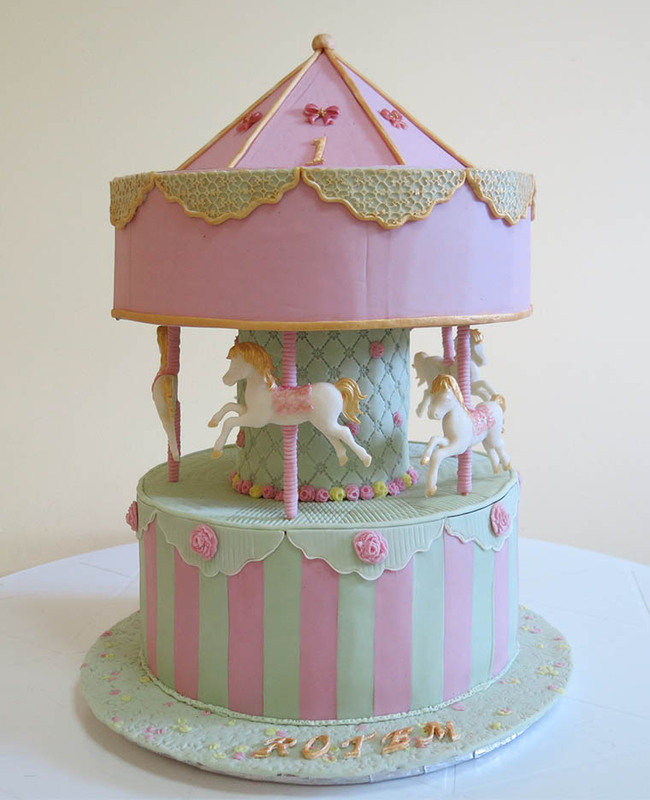 You can see it used on my Carousel cake. In fact I liked the soft shade so much that I even used it on the non edible parts of the cake. I mixed the blue into butter cream to create the sky in the Golden Girl with Balloons cake. 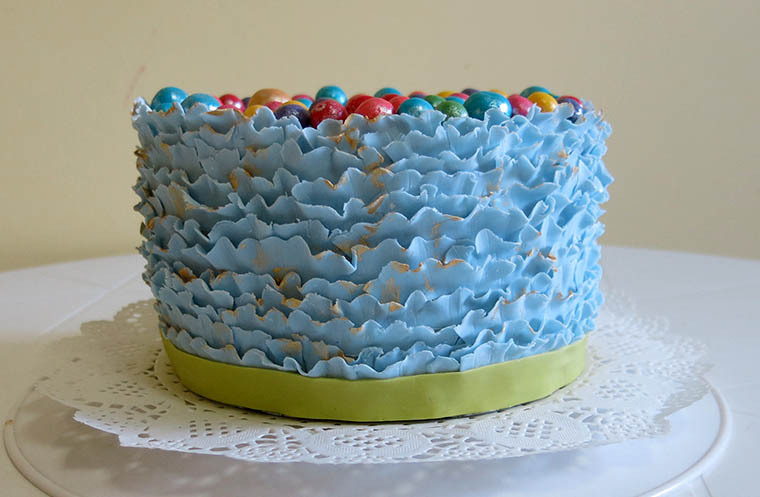 And I used the same blue for the frills on the base of my Joy cake. Here it has again been used in a modeling chocolate – fondant combination. 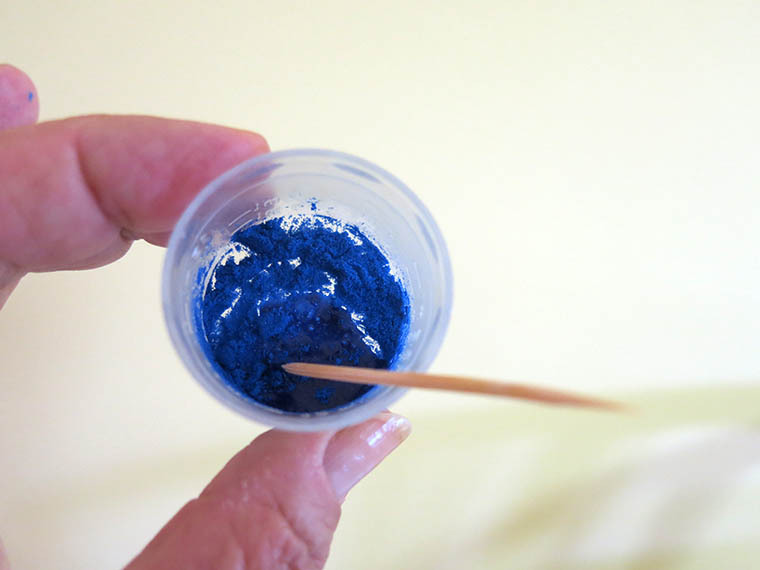 Another important note is that since the colors are sold as a powder in a container, only a small bit needs to be mixed with a few drops of water to reconstitute it. As long as the remainder of the powder stays dry in its container it can last for a very long time – but it must stay dry. A slightly damp utensil can cause the unused portion of the powder to clump up making it difficult, although not impossible, to use. So…how to use these fantastic ‘gel’ colors? 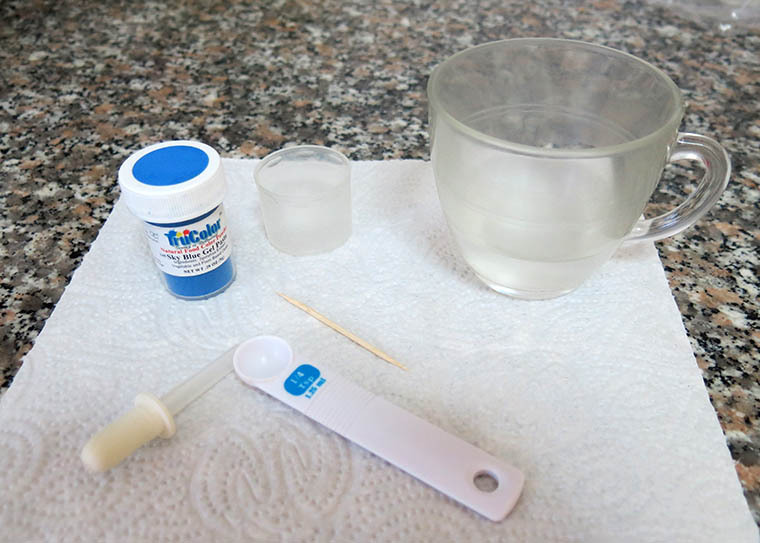 It is important for all the powder to be dissolved so I added another 10 drops. Sometimes it helps if the water is warm or even hot, but in any case don’t add more water than needed. That might weaken the color and possibly the butter cream as well. It is always best to add the water just a few drops at a time. I decided that I wanted a slightly stronger blue so I repeated the process with another 1/4 teaspoon of color and another 20 drops of water. 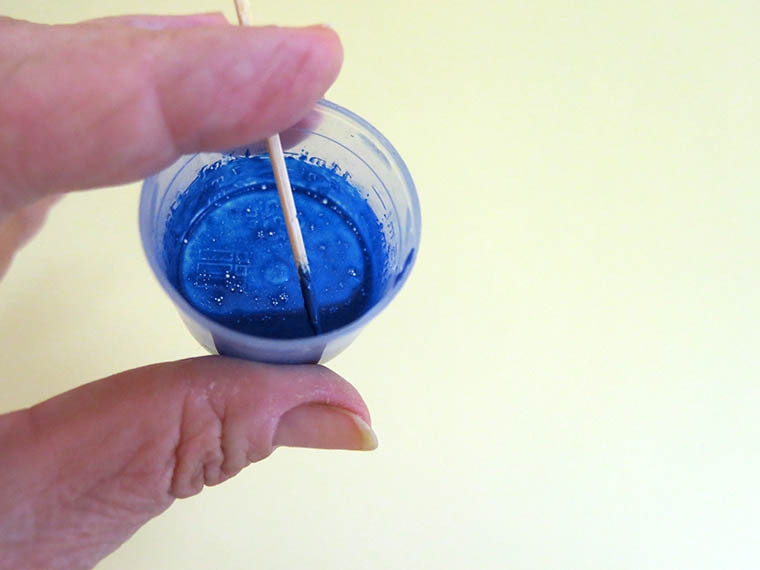 There is definitely more work to this than to just dipping a toothpick into a synthetic gel color, but I know that when I deliver or share a cake with friends and family that it is really good to eat. I am not affiliated in any way with Wilton, Magic Colors or TruColors. All the impressions and opinions shared in this article are mine alone. Thx for sharing! Food additives and colors are something that have been bothering me when presenting a cake to my family. Another thing were transfats but I have since changed my American buttercream to an Italian meringue buttercream that tastes better and has no trans fats.